LOS ANGELES (July 07 2016) – On Jeff Beck’s forthcoming studio album LOUD HAILER, his first in six years, the legendary guitarist combines fluid fretwork with topical lyrics to make a powerful statement about everything from the love of power, to the power of love. LOUD HAILER will be available on Atco Records, an imprint of Rhino Entertainment, on July 15 on CD, LP, and digitally. Loud hailer, which is another name for a megaphone, is a suitable moniker for an album that isn’t shy about speaking its mind. The two-time Rock and Roll Hall of Famer explains: “I really wanted to make a statement about some of the nasty things I see going on in the world today, and I loved the idea of being at a rally and using this loud device to shout my point of view.” The album’s first single, the riotous rocker “Live In The Dark,” will be unleashed soon. 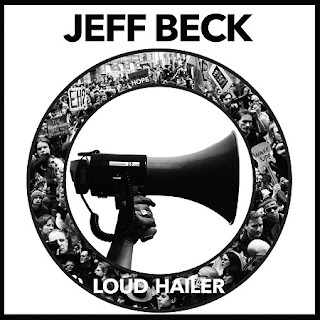 Beck produced LOUD HAILER with Filippo Cimatti, who also works with Rosie and Carmen. In addition to the core trio, the album also features drummer Davide Sollazzi and bassist Giovanni Pallotti, who were both recruited by Cimatti. A few days after the album’s release, Beck will launch a summer tour of the U.S. with blues legend Buddy Guy. And on August 10, Beck, with special guests to be announced shortly, will make his Hollywood Bowl debut for a very special, career-spanning concert that celebrate 50 years of ‘dynamic music making.’ “It will be head teacher Beck in a gown and mortar board in front of the class giving everyone a history lesson,” he jokes. The show will also include an orchestra. Inspired by the sleek curves, luxurious finish and iconic imagery of the hot rods he builds, BECK01 is hand-bound in leather and aluminum with every book numbered and personally signed by the author, Jeff Beck. The guitarist’s handpicked selection of more than 400 rare and unseen photographs and items of memorabilia is narrated with an original manuscript of nearly 20,000 words, making BECK01 the definitive visual and historical record of the dynamic musician. Included is an eloquent forward by John McLaughlin that begins, “Jeff Beck is my all-time favourite guitarist, what do I say after that?” Indeed.